Kabamaru Series by Hajime Okamoto. These playful cats each have their own name and personality. Kabamaru is the leader of the group, taking good care of his friends. "Kaba" in Japanese means "hippo" and "maru" means "round." He's named that because he's a bit of a slow walker. Urume is a laid back tomboy. Sakon considers Kabamaru to be a brother. He loves to play with things that move. Momoji is a silly boy with a charming face. 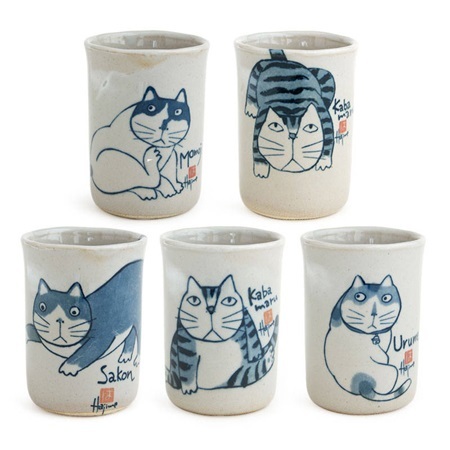 You get one of each (two of Kabamaru) in this cup set.